Green beans are my FAVORITE vegetable! 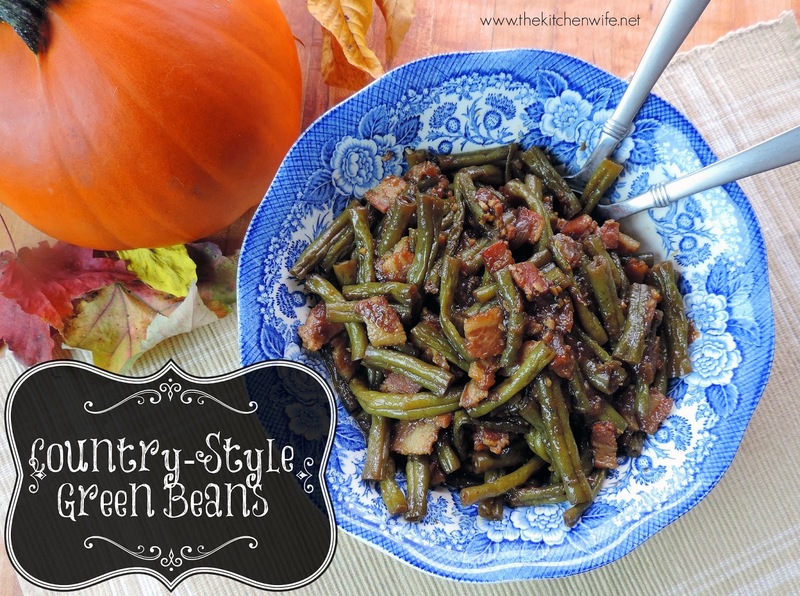 I love them in a multitude of ways, but my favorite is the Country-Style Green Beans or "cooked to death with bacon" way! At Thanksgiving you can never make enough of these for my family. I know what you are thinking "Why in the world would I cook these, from scratch, for hours , when I could make them in a couple minutes from a can?" Well, once you try these I think the question will be "Why Wouldn't You?" The best part about this dish, you can make it on the stove-top OR in the slow-cooker, and BOTH ways can be done ahead of time. Perfect for keeping your Thanksgiving prep as simple as possible. I can't wait to show you so let's get started! To get things started you will need to trim the ends off of the beans, and depending on how you like them, cut the bean into bite-sized pieces. Give them a good rise. Then, place your pot over a medium/high heat. Once the pot is hot, add 2 tbsp. of butter and 2 tbsp. olive oil. The butter adds great flavor and the olive oil gives it a higher smoke point. Next add the onion, garlic and bacon to the pan. You will only cook it long enough for the onions to soften and become translucent, and the bacon to begin to crisp and render it's fat. About 5 minutes. Next, add the trimmed green beans to the pot. And a 1/2 tsp. pepper. 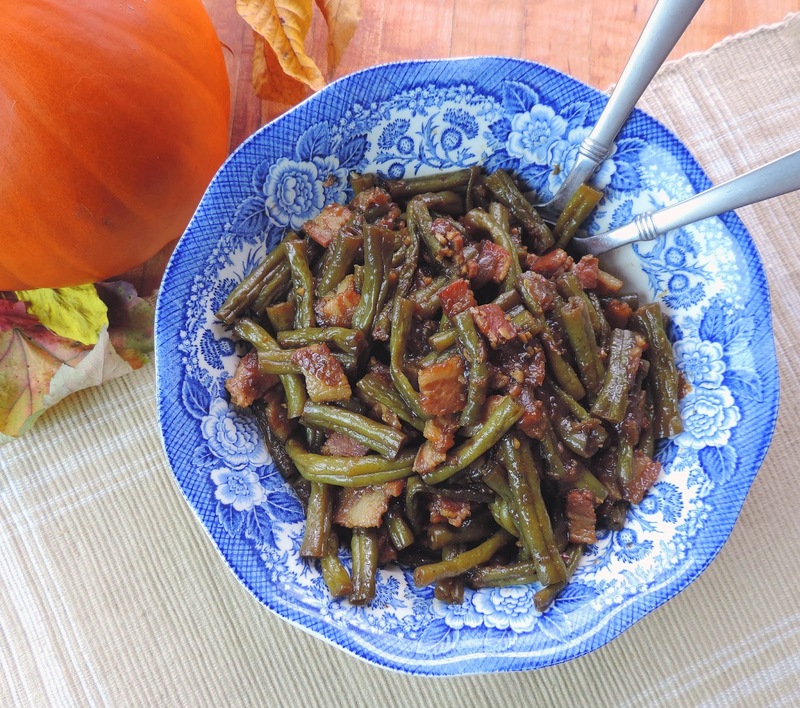 Bring the green beans to a boil and lower to a simmer. Cover and let simmer for 1 to 1.5 hours, stirring occasionally. If you want to make these in your slow-cooker, you will saute the onions, garlic, and bacon in a pan. Then, add everything to your slow-cooker, cover, and cook on low for 8-10 hours. Cut the ends off of the green beans and cut into bite-sized pieces. Place a pot over medium/high heat and add butter, oil, onion, garlic, and bacon. Cook until onions are soft and translucent and the bacon begins to crisp and render it's fat. About 5 minutes. Add the beef stock to the pot. Add the salt, pepper, and cayenne. Cover and cook for 1-1.5 hours, stirring occasionally. *If you are making this in a slow-cooker, it is at this point that you will add everything to the crock-pot, cover, and cook on low for 8-10 hours. I've made this dish for years-just like my Mom's-never knew there was a 'real' recipe,hehehe..